1. To reserve the property the client should send the names, addresses, and the age of any children of all guests and pay the £50 deposit or full payment. On receipt of full payment the owner will forward a confirmation. This is the formal confirmation of the booking. 3. The client is recommended to arrange comprehensive travel insurance (including cancellation cover), baggage, personal belongings and public liability etc., as these things are not covered by the owners insurance. 4. The rental period shall commence at 2pm on the first day and finish at 9 am on the last day. 5. The maximum number to reside in the property should not exceed 4 people. 6. The client agrees to be a considerate tenant, to take good care of the property and to leave it in a clean and tidy condition at the end of the rental period. The owners reserve the right to keep all or part of the £50 bond to cover additional cleaning if the client leaves the property in an unacceptable condition or items are broken or missing or that there are signs that smoking has taken place in the property.The client also agrees not to act in any way to cause disturbance to those resident in neighbouring properties. 7. The client shall report to the agent without delay any defects in the property or breakdown in the equipment, machinery, or appliances in the property or garden. Arrangements for repair / replacement will be made as soon as possible. 8. The owners and agent shall not be liable to the client for any temporary defect or stoppage of public services to the property, nor in respect of any equipment, machinery or appliances in the property or garden. Nor for any loss, damage, or injury, which is the result of any adverse weather conditions, riot, war, strikes or other matters beyond the control of the owners and agent. The owners and agent are also not liable for any loss, damage or inconvenience caused to or suffered by the client if the property shall be destroyed or substantially damaged before the start of the rental period. In such an event the agent shall within seven days of notification to the client, refund to the client all sums previously paid in respect of the rental period. 9. Under no circumstances shall the owner's liability to the client exceed the amount paid to the client for the rental period. No refunds will be given after the departure date, any complaints should be received by the owners prior to departure. 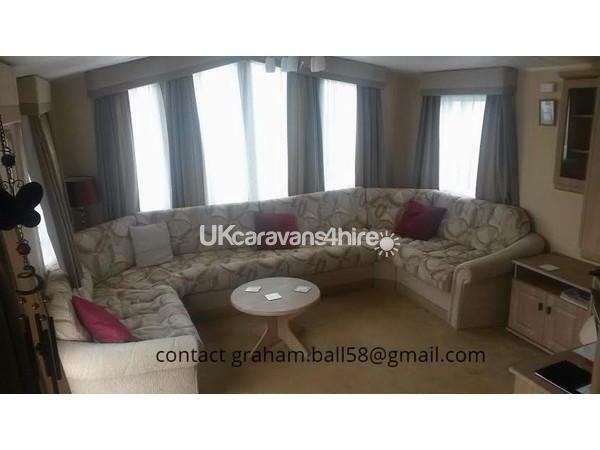 The Caravan as an open plan lounge with a large U shaped seating area and a feature gas fire leading to fixed dinette seating and central heating and double glazed throughout. Free Sat TV is provided and Wi-Fi is available at an extra charge through the park operator. 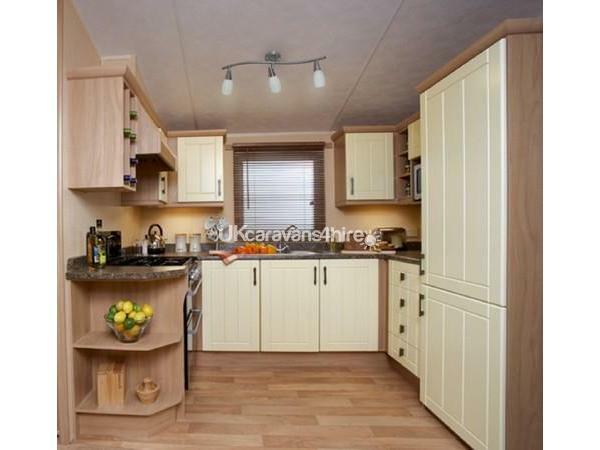 The Kitchen is spacious with plentiful cupboard and worktop space, as well as an integrated fridge-freezer, gas cooker, hob, microwave, toaster and is fully equipped for all of your self-catering requirements. 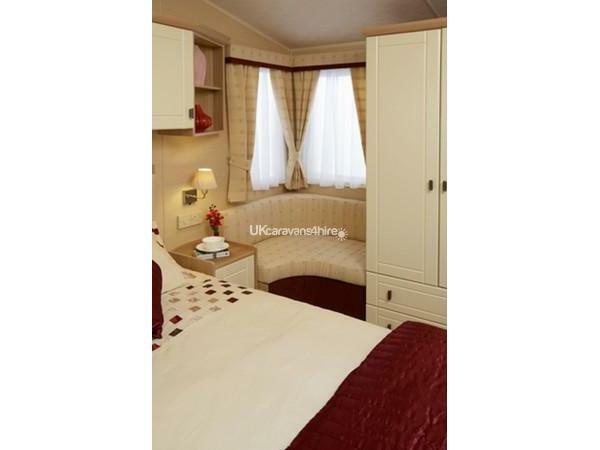 The generously proportioned main bedroom with king-size bed, en-suite toilet, 'his and hers' wardrobes and sculpted corner window seat. The second bedroom has two single beds. Duvets and pillows are provided with bed linen, ie duvet covers, sheets and pillow cases. There are protectors on all mattresses and pillows. 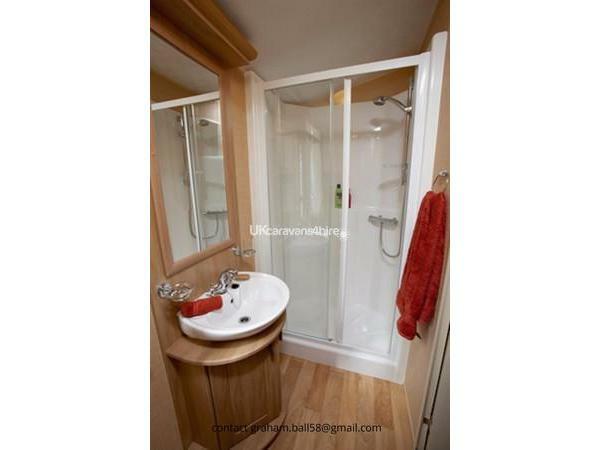 The bathroom has a spacious shower, toilet and wash basin. 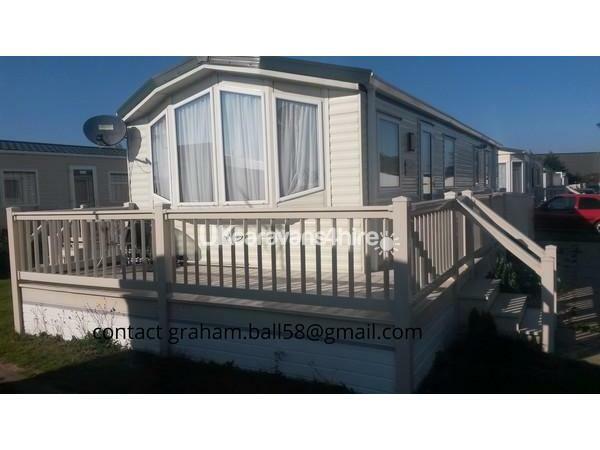 The outside has decking leading from the door around the front of the caravan which is south facing so attracts the sun all day, there is a gate on the decking making it secure for children. Patio table and chairs are provided on the decking. 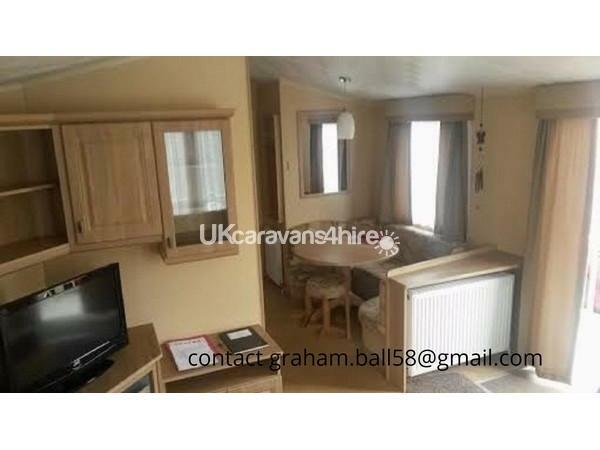 The caravan is fitted with a fire extinguisher, working smoke and carbon monoxide alarms, and the owners live in Felixstowe. 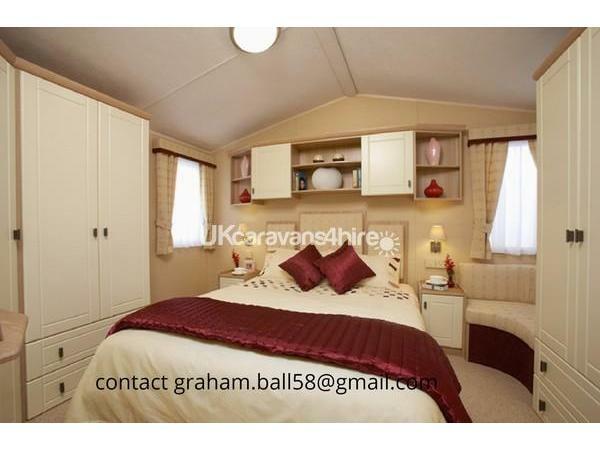 The caravan is in a safe location with convenient parking next to the caravan. 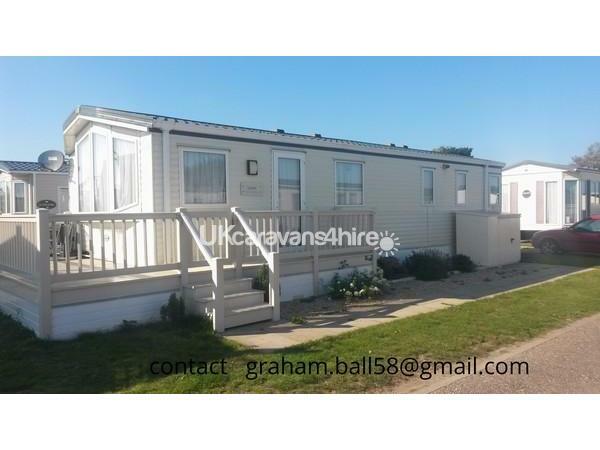 Suffolk Sands Holiday Park is a quiet, site ideal for adults and children who like peace and quiet. The Beach and Nature Reserve leading to Landguard Fort are all in walking distance, also close to the Ports viewing area on the river Orwell, it is in walking distance of the Town centre and the resorts facilities and ideal for sightseeing around Suffolk and parts of Essex. No reviews found. If you have recently stayed in this holiday home please leave a review, it only takes a few moments and will really help future guests when they are searching for holiday accommodation at Suffolk Sands Holiday Park.